Hemp is one of the oldest domesticated crops known. It has been used for paper, textiles, and cordage for thousands of years. So what is hemp and how does it differ from the psychoactive form of cannabis that we consume medicinally? There are several different varieties of the cannabis plant. Hemp refers to the non-psychoactive (less than 1% THC) varieties of Cannabis sativa L. Both hemp and marijuana come from the same cannabis species, but are genetically distinct and are further distinguished by use, chemical makeup, and cultivation methods. Hemp can be grown as a renewable source for raw materials that can be incorporated into thousands of products. Its seeds and flowers are used in health foods, organic body care, and so many other products. The fibers and stalks are used in hemp clothing, construction materials, paper, biofuel, plastic composites, and more. Hemp is an attractive rotation crop for farmers. As it grows, hemp breathes in CO2, detoxifies the soil, and prevents soil erosion. What’s left after harvest breaks down into the soil, providing valuable nutrients. Hemp requires much less water to grow, requires no pesticides and is much more environmentally friendly than traditional crops. Hemp can do a lot, but it can’t get you “high.” Because hemp varieties contain virtually zero tetrahydrocannabinol (THC), your body processes it faster than you can smoke it. Trying to use hemp to put you on cloud nine will only put you in bed with a migraine! 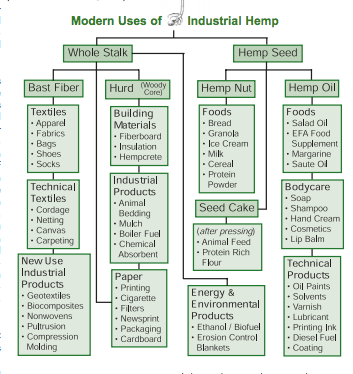 In January of 2015, The Industrial Hemp Farming Act (H.R. 525 and S. 134) was introduced in the House and Senate. If passed, it would remove all federal restrictions on the cultivation of industrial hemp, and remove its classification as a Schedule I controlled substance. One acre of hemp will produce as much fiber as 2 to 3 acres of cotton on an annual basis. Hemp fiber is stronger and softer than cotton, lasts twice as long as cotton, and will not mildew. Cotton grows only in moderate climates and requires more water than hemp. Hemp is frost tolerant, requires only moderate amounts of water, and grows in all 50 states. Cotton requires large quantities of pesticides and herbicides--50% of the world's pesticides/herbicides are used in the production of cotton. 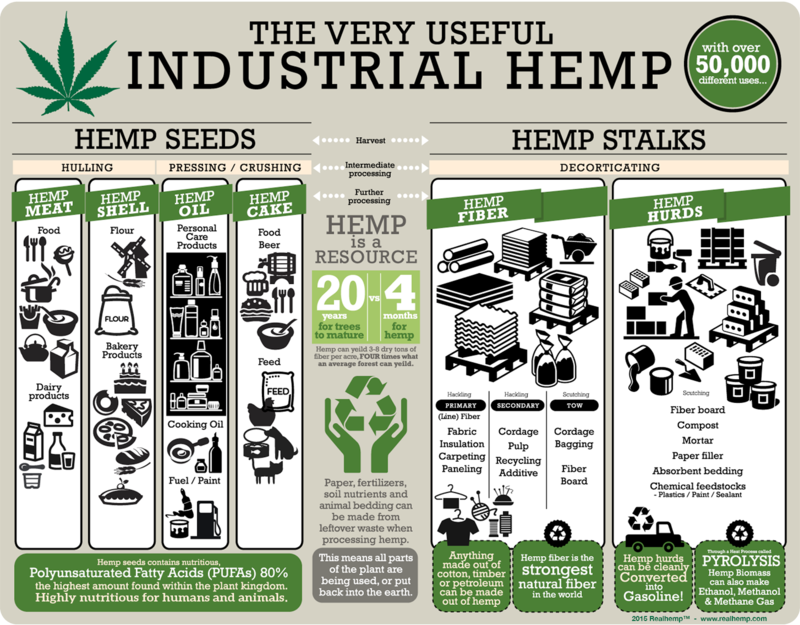 Hemp requires no pesticides, no herbicides, and only moderate amounts of fertilizer. One acre of hemp will produce as much paper as 2 to 4 acres of trees on an annual basis. From tissue paper to cardboard, all types of paper products can be produced from hemp. The quality of hemp paper is superior to tree-based paper. Hemp paper will last hundreds of years without degrading, can be recycled many more times than tree-based paper, and requires less toxic chemicals in the manufacturing process than does paper made from trees. Hemp can be used to produce fiberboard that is stronger and lighter than wood. Substituting hemp fiberboard for timber would further reduce the need to cut down our forests. Hemp can be used to produce strong, durable and environmentally-friendly plastic substitutes. Thousands of products made from petroleum-based plastics can be produced from hemp-based composites. It takes several years for trees to grow until they can be cut down for paper or wood. hemp is ready for harvesting only 120 days after it is planted. Hemp can grow on most land suitable for farming, while forests and tree farms require large tracts of land available in few locations. Harvesting hemp rather than trees would also eliminate erosion due to logging, thereby reducing topsoil loss and water pollution caused by soil runoff. Hemp seeds contain a protein that is more nutritious and more economical to produce than soybeans. Hemp seeds are not intoxicating. Hemp seed protein can be used to produce virtually any product made from soybean: tofu, veggie burgers, butter, cheese, salad oils, ice cream, milk, etc. Hemp seed can also be ground into a nutritious flour that can be used to produce baked goods such as pasta, cookies, and breads. Hemp seed oil can be used to produce non-toxic diesel fuel, paint, varnish, detergent, ink and lubricating oil. Hemp seeds account for up to half the weight of a mature hemp plant, hemp seed is a viable source for these products. Just like corn can be made into clean-burning ethanol fuel..so can hemp. Because hemp produces more biomass than any plant species (including corn) that can be grown in a wide range of climates and locations, hemp has a great potential to become a major source of ethanol fuel. Many wild hemp plants currently grow throughout the U.S. and like hemp grown for industrial use it has no drug properties because of its low THC content. U.S. marijuana laws prevent farmers from growing the same hemp plant that proliferates in nature by the millions. From 1776 to 1937, hemp was a major American crop and textiles made from hemp were common. 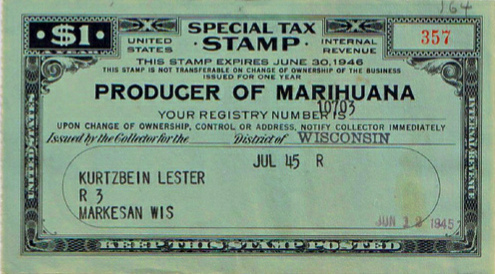 Yet, The American Textile Museum, The Smithsonian Institute, and most American history books contain no mention of hemp. The government's War on Drugs has created an atmosphere of self censorship where speaking of hemp in a positive manner is considered politically incorrect or taboo.